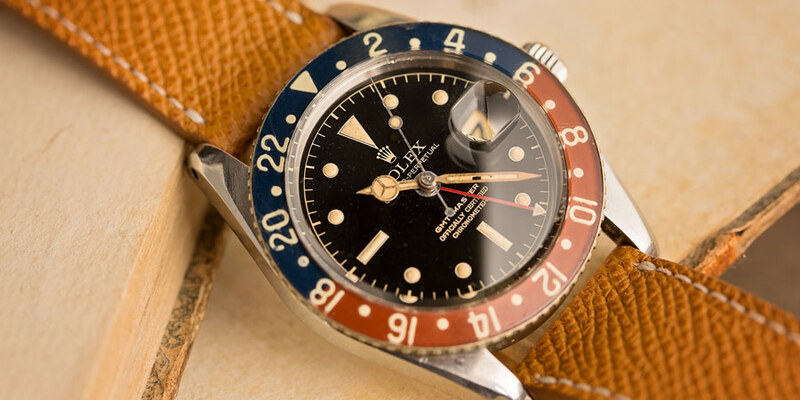 While it may not have been the very first incarnation of the GMT-Master that Rolex ever put forward, the reference 1675 is likely the first watch that comes to mind whenever the words, “vintage Rolex GMT” are mentioned. With a production span of more than twenty years, the reference 1675 marks the beginning of a number of traits that have now become standard on the GMT-Master line; and many would consider it to be the quintessential vintage example of Rolex’s iconic pilot’s watch. Today we want to highlight the GMT-Master 1675. The original GMT-Master, the reference 6542 was really more of a modified version of Rolex’s Turn-O-Graph, than a watch entirely constructed for its own specific purposes. It was not until the release of the second generation of the GMT-Master, the reference 1675, that Rolex’s legendary pilot’s watch began to become a timepiece entirely of its own design. Rather than sharing the same 38 mm case as Rolex’s Turn-O-Graph and Submariner lines of watches, the reference 1675 brought the GMT-Master’s case diameter up to 40 mm and also introduced crown guards for additional protection. Although Rolex’s Submariner dive watch also had crown guards by this point in time, the larger, Triplock winding crown of the Submariner gave it a much different overall appearance, allowing the newly redesigned reference 1675 GMT-Master to be a watch entirely of its own design. Here is a Vintage Rolex Two-Tone GMT Master. The reference 1675 is also the only GMT-Master that has ever been fitted with both glossy gilt dials, and the later era matte dials that replaced them – a change that took place around 1965. Due to its twenty-year long production run, the reference 1675 also experienced a number of other small changes and updates, from the upgrade in movement (caliber 1565 to caliber 1575), to the introduction of an all-black bezel insert during the early 1970s. Due to the multitude of different changes that took place throughout the production period of the reference 1675, surviving examples can be found with a variety of different dials, hands, bezel inserts, movements, crown guards, and bracelets. 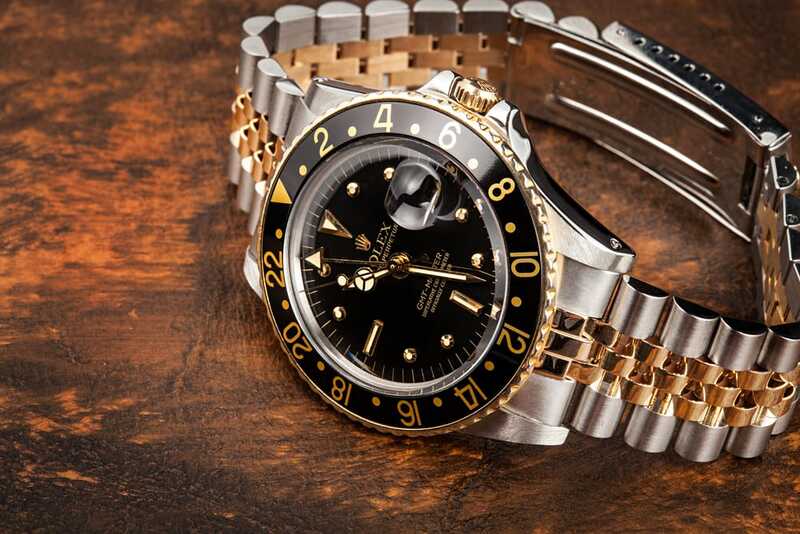 This remarkable diversity adds to the excitement and pursuit for vintage Rolex collectors, and also helps to identify the age of different reference 1675 watches. This vintage GMT-Master 6542 is a rare watch that set the foundations for the 1675. Subsequent iterations of the GMT-Master introduced additional features, such as rapid setting date complications, independently adjustable hour hands, sapphire crystals, and ratcheting bezels. 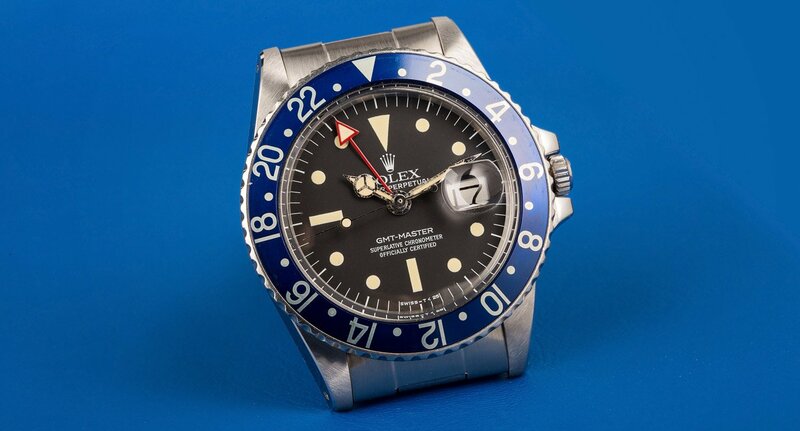 However, the reference 1675 largely remained true to the original design concept of the GMT-Master, with the only additional feature over the reference 6542 being the ability to stop the seconds hand while setting the time – a feature that was added in 1971 when Rolex implemented the caliber 1575 movement into their GMT-Master line of watches. The reference 1675 marks the point in the GMT-Master’s history where Rolex’s multi-time zone, pilot’s watch became a unique offering in the Rolex lineup. With the release of the reference 1675, the GMT-Master could no longer be considered a modified version of a preexisting watch, but rather a timepiece that was conceived from the ground up to be entirely its own specialized design.